“I’m going to be Picasso’s first Black mistress.” Linda Goode Bryant would announce at family gatherings when she was a girl. Rather than imagine her own success, she pictured herself at Picasso’s side. That’s all a black girl with artistic aspirations dared hope for in the early 1960s. 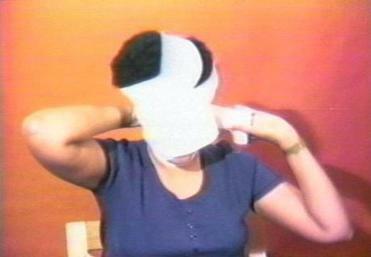 In 1974, Bryant founded Just Above Midtown Gallery, in New York, as a space for black artists. The gallery — known familiarly as JAM — collided with racism from the get-go. Realtors in the 57th Street gallery district spurned Bryant because they assumed black art meant paintings on black velvet. Other gallerists gave her the cold shoulder. She kept on, eventually moving to Tribeca and promoting experimental work. The gallery closed in 1986. The story of JAM is one of many brave endeavors spotlighted in “We Wanted a Revolution: Black Radical Women, 1965-1985,” at the Institute of Contemporary Art through Sept. 30. Politicized black women were doubly cursed, invisible to white feminists and black activists alike. Artists struggled to get their work seen. This exhibition, organized by the Brooklyn Museum, celebrates them. These women were heroes. They worked to upend the system. They took art to places no one else did. They protested, sometimes with cunning humor. They threw conceptual grenades. They showed their own work, and in time the art world blinked awake and started exhibiting it, too. It’s a glorious and sobering show, resounding painfully in these days of Black Lives Matter and #MeToo. Groups back then, such as Boston’s Combahee River Collective of black lesbian feminists, paved the way for today’s intersectionality. For those of us who remember the era, the exhibition is humbling to see. I was a young feminist in the 1980s, and “We Wanted a Revolution” reminds me how blinkered I was. A generation of artists born in the 1940s took up the torch carried by Elizabeth Catlett and Lois Mailou Jones, activist artists born in the early 1900s and still working well into old age. Catlett made “Target” after two Black Panther activists were killed in a police raid in Chicago in 1969. A bust of a black man set behind a gun sight, it made my hair stand on end. Some things have gotten better. Many have not. The show opens warmly with Faith Ringgold’s painting “For the Women’s House.” Awarded a public art grant, the artist offered to create a work for various colleges. They rejected it. “Then I thought, a women’s prison would be the best bet because nobody wants to go there,” Ringgold told her daughter, Michele Wallace, in a 1990 interview. She went to the House of Detention for Women, now closed, on Rikers Island, in New York, and asked the prisoners what they wanted to see in a mural. The answer: diverse women in solidarity. The square mural is sliced like a pie into eight triangular scenes of women: studying, mothering, working, playing basketball. One slice features a bus driver — before women were hired to drive buses in New York. Ordinary today. Revolutionary in 1971. Solidarity was key to these artists, too. Women leaned on each other, artists experimented together, and groups agitated against blank-faced institutions. 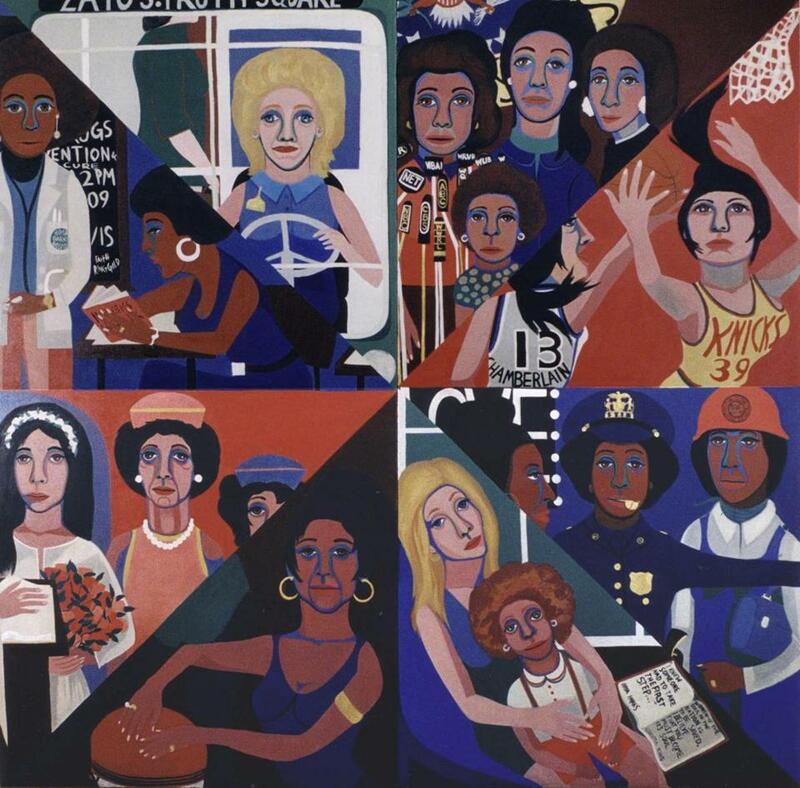 Ringgold — a central figure in the show — helped spearhead a protest outside the Whitney Museum of American Art in 1970 orchestrated by three groups: Women Artists in Revolution, Women’s Ad Hoc Committee, and Women Students and Artists for Black Art Liberation. Demonstrating outside the museum, they passed out a sharp, cheeky flyer. “THE WHITNEY STAFF SUFFERS! GRAVELY! FROM ACUTE MYOPIA,” it read, and enumerated the Annual Exhibition’s measly track record including women. The protest worked: The Whitney soon after showed work by Barbara Chase-Riboud and Betye Saar, both represented here. Another flame thrower, Lorraine O’Grady, crashed the “Personae” show at the New Museum — and other venues — as “Mlle Bourgeoise Noire.” The costume was fashioned from 180 pairs of white gloves and she carried a cat-o-nine-tails, rallying black artists and calling white institutions on the carpet. Pindell’s gorgeous, expansive abstract paintings hang in the next gallery. “Carnival at Ostende” is a pale, mixed-media canvas, pebbled and color-flecked with punched-paper circles, every inch a discovery. Intimate, stitched, and scarred, it anticipates Mark Bradford’s dense, topographical collages seeded with history. The youngest artists in the show, Carrie Mae Weems, Lorna Simpson, and Alison Saar (Betye’s daughter) dominate the last gallery. They powerfully reflect on black life — family bonds, aching history, social communication. Their refutation of racial power dynamics is implicit as they celebrate their own turbulent riches. The artists in “We Wanted a Revolution” did not flag confronting ignorance. They won some skirmishes. The battle continues. “Arthur Jafa: Love is the Message, the Message is Death,” an epic and thrumming seven-and-a-half-minute video installation on view in an adjoining gallery, gathers black American history of the last 50 years or so into a mesmerizing filmic collage that’s at once a shout of joy and an elegy. Set to Kanye West’s gospel-inflected “Ultralight Beam,” the video pulses with a quick rhythm of found footage: revelers, James Brown, Muhammad Ali; Obama singing “Amazing Grace” after the 2015 massacre at a black church in Charleston; cops tackling, arresting, and threatening black people. The refrain: the seething orb of the sun, reflecting the fever back here on earth, and lending a sense of eternity to Jafa’s theme — the eternity of oppression, and the persistence of love and honor in its face.